Candles, pumpkins, baking, wearing sweaters, hot chocolate & tea... There is something about Fall that makes me feel cozy & comfy everytime I just think about it. It's my most favorite season of the year and I truly miss the real Autumn. Leaves falling from the trees are my association with this time of a year. Living in such a warm climate of Florida has its own pros and cons for sure. We still get some cold waves occasionally, most likely in November and December. Yay! I made this inspirational Autumn wishlist because I simply can't wait to wear sweaters and hoodies and boots again. I love being able to layer clothes. I've been recently obsessed with vintage pink color and it seems like this shade of pink matches great to those warm colors of Fall. 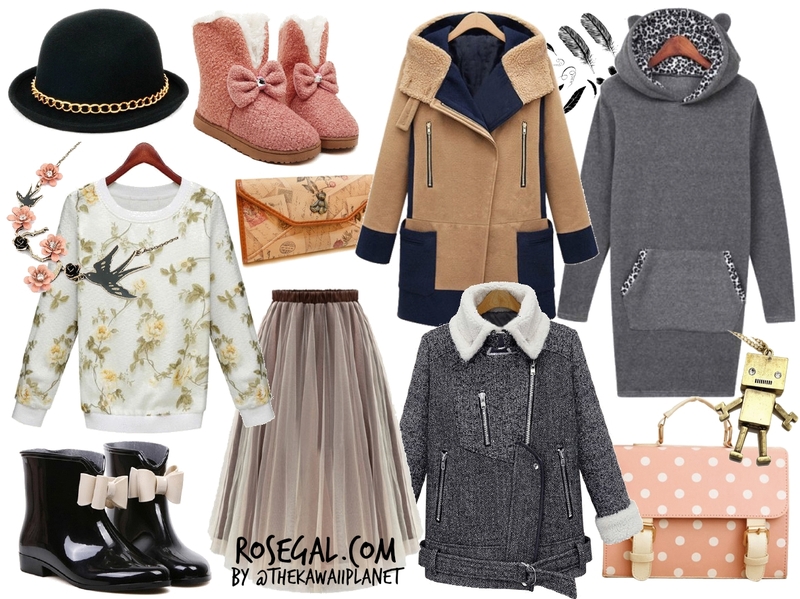 Rosegal has some really nice, cute and warm coats and jackets, and much more! Grey, camel, black, white & brown - these grounded colors are my cup of tea in the cold season. You just need to sparkle it with a little bit of... PINK! What is your most favorite item from this wishlist? Oh, I am loving that beige and navy coat. That looks very warm and stylish. The fall is a hit or miss for me - I do like layering a bit but I hate not getting to wear shorts anymore! The beginning of fall has the perfect temperature for both of those things, layers and shorts! Oh I love autumn! Summer has been great, but I can't wait to get into some cute fall clothes! I love that grey and leopard hoodie. Alas, the fall is upon us. A cozy selection you got there. Greetings friend! OMG, I'm loving the navy and camel coat. The hood that also resembles a portrait collar is so chic. What a great find. Love it!!! I love everything on this wishlist. Great ensemble and hope you get some. Ta dlouhá sukně je boží! I absolutely love these coats, and the floral sweater is super cute! This is definitely a very KAWAII selection! Love the birdie sweater, very cute! Suzy I love your wishlist! I love the color palette of your choices! I do sometimes wear hats, but usually beanies. OMG I love the skirt! !